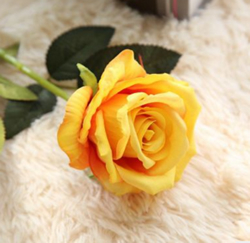 Artificial Flower Rose , Orange Yellow ,High quality Velvet,A bunch with 10 heads ,Free Shipping to worldwide area. Momda recommended trustworthy Supplier. Rose , Artificial Flower, Orange Yellow. Material: Velvet . A bunch(includes 10 heads.